Anyone doesn't know Ebay? Anyway, one day a small parcel was in my P.O. box and beside the CD I bought at an auction I also got a 2-track tape of a band named Sencirow which is from the German town Bad Laasphe. The 2 tracks which are from their first demo Dreamscape been just great and so I ordered the 2 CDs the band had released. I paid them, coz if a band like Sencirow doesn't get a deal, we have to support the underground so that bands can produce on their own. 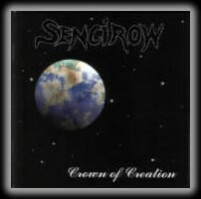 I did my part and what Sencirow offer on Crown Of Creation is better then the average. They play heavy metal and even if their debut Dreamscape is a little better, this is quite good. Anyway, with The Hermit, Daydream, Judgment Day and Wages Of Fear they recorded catchy tracks which are crowned by a solo here and there, but with a lot of power! The production is okay, even if not excellent and singer Daniel Seifert has to offer a larger variety, but this is supreme power metal from Germany! The quintet is influenced by Iced Earth, a little Iron Maiden, but not in a way they can be called clones. Hey, you ignorant A&R's here in Germany! Stop signing just clones of Stratovarius and Hammerfall and why not signing bands from Germany? If there is anyone who wants to spend 100,000 Euro and wants to invest the money into a label, just call me! One day our heroes will die and without a perspective young bands won't be around to take their place. And newcomers won't have the motivation to start the fight. So, fight the fight! You guys are on the right track!! !